- with a sign near his door "Home of a Proud California Democrat". With the new year comes new laws. A total of 745 were passed by the Legislature and signed by the governor this year and when lawmakers return next week for a new session, the lawmaking will continue. Which got us wondering, did California actually have that many problems in 2011? For help, we turned to Brown, who offered some insight on why he signed some measures. In a word: Because they were "useless." Brown said while some bills get winnowed and defanged during the legislative process, for many lawmakers it's the only thing they have to show for their time at the Capitol. "Just because a bill is useless doesn't mean I should veto it, because there's a certain comity required. That's the word, comity, between the two branches," Brown said, adding later, "It's a bit discouraging sometimes to be a legislator and all you have is a few bills." We followed up on that by asking the governor just how many useless bills he signed this year. He wouldn't bite. "That's known only to me and my advisers," he said. Shooting yourself in the foot: When the California Redevelopment Association sued California over a plan to eliminate the state's redevelopment agencies and replace the program with a smaller version, officials were hoping the state's high court would allow the 6o-year-old economic development program to stay whole. Instead, the California Supreme Court said the state was within its right to abolish the agencies. And it found that the plan to keep the agencies alive, although smaller, was in fact unconstitutional because it forced local cities and counties to give up funds to the state to keep their programs alive. Adding insult to injury, the court used the association's own law to prove its argument. "It backfired pretty massively," said land use attorney Michael Kiely, a partner at the Sheppard Mullin firm in Los Angeles. "It kind of reminds me of that scene in the movie `Raiders of the Lost Ark,' when Harrison Ford is facing a guy with a big sword who is waving it around like a maniac, and Harrison Ford just shoots him." Redevelopment Association interim Director Jim Kennedy acknowledged that the high court's decision was the worst-case scenario, and not at all what his group intended when they filed the suit. But he remains confident supporters can work with lawmakers in the new year to preserve some form of redevelopment. Kiely isn't so sure. `Anything that's done now is basically funding a new program in the middle of budget cuts," he said. And let's not forget that Gov. 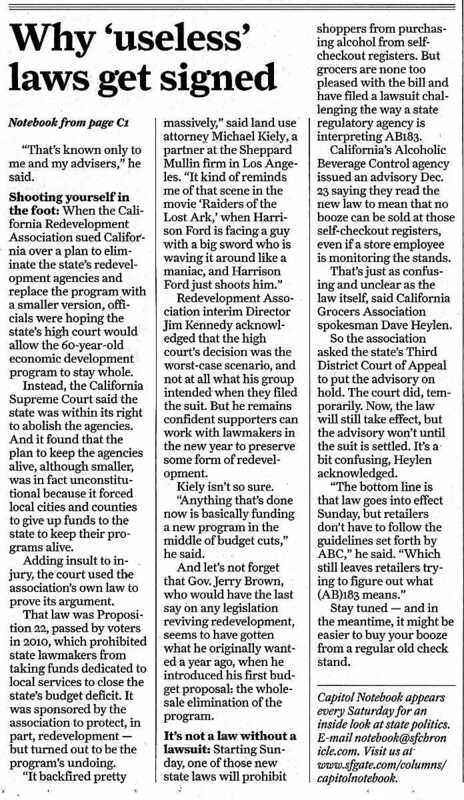 Jerry Brown, who would have the last say on any legislation reviving redevelopment, seems to have gotten what he originally wanted a year ago, when he introduced his first budget proposal: the wholesale elimination of the program. It's not a law without a lawsuit: Starting Sunday, one of those new state laws will prohibit shoppers from purchasing alcohol from selfcheckout registers. But grocers are none too pleased with the bill and have filed a lawsuit challenging the way a state regulatory agency is interpreting AB183. California's Alcoholic Beverage Control agency issued an advisory Dec. 23 saying they read the new law to mean that no booze can be sold at those self-checkout registers, even if a store employee is monitoring the stands. That's just as confusing and unclear as the law itself, said California Grocers Association spokesman Dave Heylen. So the association asked the state's Third District Court of Appeal to put the advisory on hold. The court did, temporarily. Now, the law will still take effect, but the advisory won't until the suit is settled. It's a bit confusing, Heylen acknowledged. "The bottom line is that law goes into effect Sunday, but retailers don't have to follow the guidelines set forth by ABC," he said. "Which still leaves retailers trying to figure out what (AB)183 means." Stay tuned - and in the meantime, it might be easier to buy your booze from a regular old check stand. Capitol Notebook appears every Saturday for an inside look at state politics: E-mail notebook@sfchronicle.com. Visit us at www.sfgate.com/columns/ capitolnotebook.